There are different ways to get exposure to precious metals, but streaming and royalty companies stand out from the pack in good markets and bad. If you are thinking about investing in gold and silver today, just in case the markets hit a prolonged weak patch, then you need to take a close look at streaming companies like Wheaton Precious Metals Corp. (NYSE:WPM). Here's a deep-dive look at how this company is trouncing miners today (and will continue to do so in the future). Mining is a capital-intensive and complex business, requiring a gold miner to find locations that may contain precious metals, build a mine (a process than can take a decade or more), run the mine, and, once all the material it's economical to extract has been removed, shut the mine down. That's a vast simplification of a time-consuming and costly endeavor, of course, but it gives you an idea of the process. And since mines are depleting assets, miners must always be on the lookout for new mine locations if it wants to maintain or grow production. By comparison, Wheaton Precious Metals' business is pretty simple. It provides money to miners so they can fund their mining efforts. In exchange for up-front cash, Wheaton gets the right to buy gold and silver at contractually locked-in rates in the future. The best part, however, is that the costs are usually pretty low. Every streaming deal is a little different, but a couple of examples will help explain. In 2015, when miners were struggling through a period of low commodity prices, Wheaton inked streaming deals with mining giants Vale SA and Glencore. The streaming company agreed to pay Vale $900 million up front for the right to buy gold from Vale's Salobo mine at the lesser of $400 an ounce or the prevailing spot price of the metal. With Glencore, the company agreed to pay $900 million up front as well. In exchange Wheaton will get to buy silver from the Antamina mine for 20% of spot price. These are just two examples. Wheaton currently has investments in 20 operating mines and eight development projects. So it's best to look at the company's investments as a portfolio. When you do that, it becomes clear that Wheaton is, basically, trouncing miners when it comes to costs. Cash cost is an industry metric that measures the mine-level expenses of producing an ounce of gold or silver. Taking a quick look at second-quarter numbers, Wheaton's cash cost for gold was $407 an ounce. For silver, the company's cash cost was $4.54 an ounce. Wheaton's average realized prices for those metals in the second quarter were $1,305 per ounce of gold and $16.52 per ounce of silver. That's a nice spread, but it's important to remember that Wheaton can't do too much to control the spot price of gold and silver, which are commodities. However, the streaming model does a great job of controlling the one thing Wheaton can control -- costs. Some comparisons will help here. Barrick Gold, one of the largest gold miners in the world, had cash costs of $605 per ounce of gold in the second quarter. Coeur Mining Inc., meanwhile, had cash costs of roughly $10 per silver equivalent ounce in the second quarter. Clearly, Wheaton's costs are impressively low by comparison. While these cost differences were clearly material in the second quarter, it's important to remember that this isn't a one-time event. Because Wheaton's costs are locked in and usually tied directly to spot prices, its costs are always low. That leads to very high margins in both good markets and bad. The reason for this goes back to the model -- Wheaton's costs adjust along with those of the commodities it buys. Miners, on the other hand, have to keep paying to run their mines. Changing the cost of operating a mine is a time-consuming and difficult task. 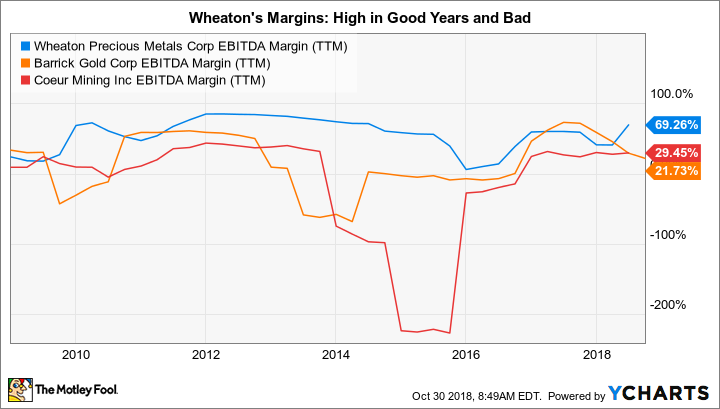 So when you look at a longer period, you'll see that Wheaton's EBITDA margins tend to remain high through both good commodity markets and bad ones. The bad times, however, are when the streaming model really shines because miners often see their margins dip into the red as they work to adjust their cost structures to deal with low commodity prices. If you are looking to invest in precious metals, your first thought may be to buy a miner. But before you do that you should take a look at a diversified streaming company like Wheaton Precious Metals. Its business model is, at its core, more robust than a miner's because of the contractually locked-in low prices it pays for gold and silver. That shows up in good markets to some degree, but really stands out in bad ones.